It’s buzzing with activity at the City Square! Park your bike at the cozy coffee bar, hop aboard the awesome news helicopter and take to the skies for a bird’s-eye view. When you’re done flying, call by the LEGO® Store where a new delivery has just arrived. Help the driver unload the boxes, place them on the handcart and wheel them into the store. Then check out the cool cars for sale at the dealership showrooms. Help the mechanic operate the car lift and fit a new set of sporty alloy rims. There’s just time to buy a hotdog and a newspaper for the journey home, but watch out for the pizza deliveryman on his speedy scooter as you head for the tram stop! Load your bike into the bike compartment, take a seat and watch the world go by as you travel through the LEGO City streets. What an exciting day! Includes 12 minifigures with assorted accessories: a tram driver, helicopter pilot, coffee shop saleswoman, pizza deliveryman, car saleswoman, mechanic, tow truck driver, hotdog salesman, LEGO sales person, LEGO delivery driver, a girl and a boy. Also includes 2 LEGO store statues. Price is 9% below the initial Lego retail price, a € 14.99 discount! The City Square (60097) Lego set is no longer directly available from the sites below. However, 3rd party partners of these sites might still have the set available. Alternate description The City Square has a LEGO® Store, car dealership, 3 cars, tow truck, LEGO truck, helicopter, tram, tram stop, bike and 12 minifigures. Includes 12 minifigures with assorted accessories: a tram driver, helicopter pilot, coffee bar saleswoman, pizza deliveryman, car saleswoman, mechanic, tow truck driver, hotdog salesman, 2 LEGO® sales personnel, a girl, and a boy. 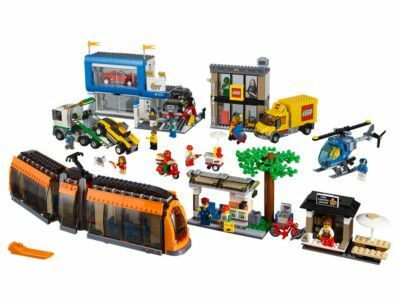 Check out the latest sets at the LEGO® Store!